It happens pretty much once a week. I love it. Hades loves it. Cherub can’t get enough of it. I love that it’s a versatile dish that takes on whatever flavor or season you throw at it. I often make it as a vegetarian dish, and we never really miss the meat on those nights. You can even skip cheese to make a vegan risotto if you top it with a delicious and simple pangrattato (PK tip: whiz up some bread crumbs, garlic, herbs of your choice a pinch of salt and then fry in a bit of olive oil until brown and crispy). This summer’s versions have included carrot and coriander or the ubiquitous tomato and basil, as well as this week’s fancy-schmancy version: shrimp with sea beans. So what is a sea bean you ask? A delicious little branched green bean looking thing that grows in salt marshes. A very salty little thing it is, too. So much so, that you need to blanch them first to get some of the salt out. 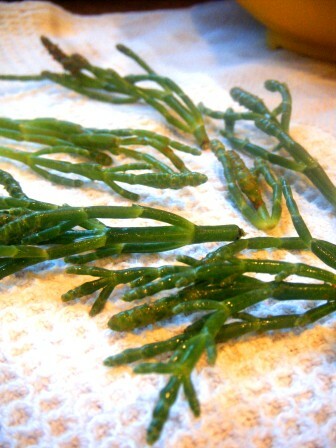 Taste-wise, it’s a bit like a tiny asparagus, in the woody sense, but with a burst of saltiness when you bite into it. Really cool. I picked these up from the Greener Grocer. They had a few in as a little treat, but most times, you won’t find much of them unless you live on the coasts. So if you happen to run across some and they look good, by all means buy them! 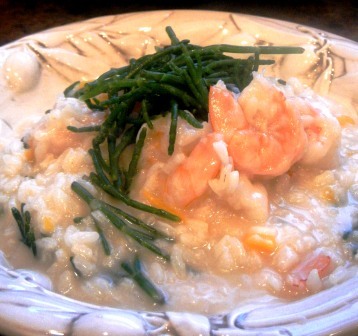 This week’s risotto was born of Rick Stein’s version in Complete Seafood. 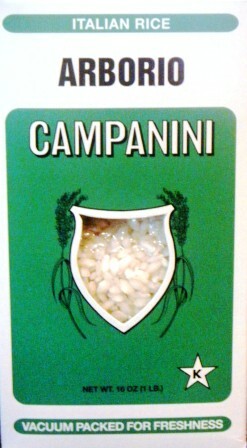 He came up with the combo, I did my version of risotto. If you are just starting out with cooking fish, and feel a bit out of your depth, there’s truly not a better cookbook than this one. I’ve even seen them on sale at Whole Foods, and it’s really worth it to purchase a copy. PK tip #2: This is one of those recipes that it’s really important to have all of your mise en place. All your ducks in a row. Organize, organize, organize! Do all your prep first, chop all the carrots, onion, measure out all your rice, have all the pots out that you need (one for the stock, one for the sea beans, one for the risotto). Have your bowls ready for serving. Heck, even clean up your prep stuff and shove things in the dishwasher or sink to get things out of the way. Now, roll up your sleeves. Pour yourself a glass of wine. This is gonna be fun. In a large pot, add one whole carrot broken in half (top included) and the top from the second carrot. Add in 1/2 of the onion, quartered and all of the papery skins (really!). Add in the shrimp shells, bay, peppercorns, tomato, celery, and parsley. Turn heat to high to get the stock up to a simmer, then turn down and keep on a low to medium heat; give it at least 15 minutes to cook before you begin the next steps with the rice. I usually use this time to clean up the first round of prep, wipe down counters, put things in the dishwasher, sip some wine. Next, in a large sauté pan, heat the olive oil over medium heat and add the other 1 half of the onion that’s been minced along with the last carrot which has been minced as well. Soften the veg for three to five minutes, stirring occasionally. Tip in the rice, stir to coat with the oil and mix in the carrot and onion. Cook for one to two minutes, then add in a nice big splash of the sake or whatever you’re using. This should evaporate pretty quickly, so stir rapidly once the liquid goes in to deglaze the pan a bit. PK tip: I normally use Noilly Prat in just about every other recipe. Now start adding in your stock. I use a ½ cup ladle, a mesh strainer and a wooden spoon. With the stock pot on simmer on the burner directly behind the pan you are cooking the risotto, (having the pans close together makes this much easier) ladle in two measures of stock through the strainer you hold over the risotto pan (set your wooden spoon down!). Then using the wooden spoon, stir the risotto to incorporate all the stock, when it’s most all absorbed, add another ladle of stock the same way as before. Repeat this process until the rice has developed its own lovely starchy sauce, and the rice is tender, but not mushy; usually 20 to 30 minutes of lovingly ladling, stirring and sipping wine. You’ll go through just about all that stock. When the rice is almost done, say 18 to 20 minutes in, you’ll need to bring a pan of water up to the boil and blanch the sea beans for one minute. Drain the beans. Now add in the shrimp to the hot risotto, along with another ladle of stock for good measure. Cook two to three minutes, depending on the size of your shrimp. Add in all but a handful of the beans (you’ll need some to garnish) and the parmesan to the risotto, stir and taste for seasoning. I found that it just needed the slightest bit of salt. It’s at this point before serving that I always add an extra ladle or two of stock. You don’t want it runny, but almost. The second risotto gets out of the pan and begins to cool, it thickens up. Always. Adding that extra stock at the end just ensures you have a lovely creamy bowl of rice, not a lump. Gross. I serve it in shallow bowls and garnish with a small pile of the sea beans that you reserved and maybe a drizzle of olive oil. It’s pretty great stuff. You must, must, must serve this with a Vinho Verde. In PK’s opinion, it’s just the most perfect pairing, a bit sparkly, super light, white and refreshing.